Nintei Nihon Restaurant introduces establishments which serves authentic Japanese cuisine outside of Japan. In recent years the popularity of Japanese food has increased widely. Especially since ” Washoku (Traditional Jpanese Cuisine)” was registered by UNESCO in 2013 giving it their Intangible Cultural Heritage status The numbers of Japanese style restaurants has grown rapidly around the world, which is exciting to see. However, this has led to some style over substance restaurants getting in on the trend mimicking Japanese style but lacking authenticity. 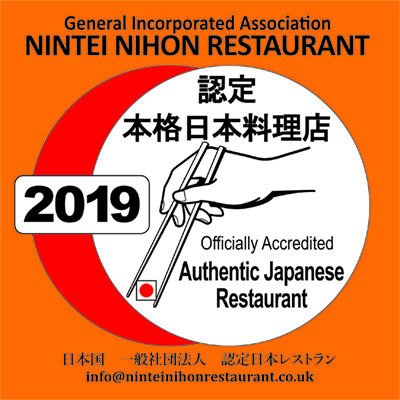 The purpose of the Nintei Nihon Restaurant guide is to recommend only the establishments serving authentic and most affordable Japanese cuisine outside of Japan. By recommending these restaurants we hope this will also encourage both owners and chefs to expand their Waashoku menu’s utilizing locally available ingredients as a part of the development. But also maintaining traditional techniques for that authentic experience. We consider it an honour if our guide will help you to enjoy Japanese food as a part of your daily life.